A responsive website describes a website which changes its layout depending on the size of the device screen on which it is being viewed - so the same content can be displayed easily whether on a mobile phone, tablet or a large desktop screen - making your website more accessible for all your customers. • Add your phone number to the page header which works as a link to call you when viewed on a mobile phone. • Add an email link to the page header for quick contact from any page. • Add a small enquiry form on the right side of your pages to encourage enquiries. 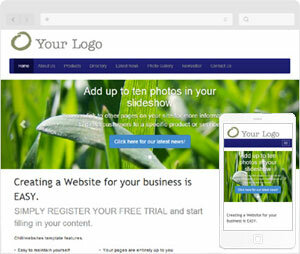 • Add background images to your website. We'll go over how to add the above features once we go through how to convert your current website to one of our responsive website templates - for most websites this is a relatively easy process. Note that this article assumes you already use Chilli Websites for your website (if you don't - you can quickly and easily setup a website here). 1 Choose the new template you want to use. All of our templates can be viewed here. Note that the first six designs are responsive designs. Amongst these you can choose if you want to have a slideshow and/or whether you want to have background images behind your website. The simplest option for converting existing sites is to use "Responsive Simple - id#1410" with no slideshow nor backgrounds but feel free to try out any of the templates. 2 Once you have chosen the template you want to convert to, login to your website administration. Click on "Content Manager" and then on "Site Style". From the "Template" drop down list on this page, select the template number and colour you have decided on. Click "Update Site" at the bottom of this page. 3 Now click on "Live Site" from the menu on the left of your Admin System. You will see a version of your website with the existing content in the new template. If the new template loads a bit funny, hold down "Ctrl" (or "Apple" on Macs) and press "F5" - this forces your browser cache to clear and loads the latest files from the server. 4 Many websites will now be done. You can test what your site will look like on smaller screens (i.e. phones) by simply resizing your browser down to a narrow width - you will see how the site changes at different widths - or you can login to your Admin System on your phone/tablet and view the site.. If your site looks good then you are finished with the conversion. You just need to send us an email (support@chilliwebsites.com.au) asking us to update your template on your actual live website (i.e. www.yoursite.com.au). You can experiment with different templates at any time as per the steps above - it will not affect your actual website until you contact us and request the update via email. which covers how to setup the new features of our responsive templates. 5 If your website has horizontal scrolling - this is most commonly caused by table widths you have set in your content on some pages. If a specific page has horizontal scrolling, open that page in the Pages Editor to edit the page and have a look at any tables on the page. In the table properties check the width - with responsive design it is best whenever possible to set the width as a percentage so that the table will scale down to fit narrow screens - i.e. if you table width is set to "1000" then this refers to pixels - try changing the width to "100%". This will fix most width issues. 6 Websites with more than 8-10 pages may have the main menu across the top of the page run onto two or more lines. The simplest solution to this is to reduce the size of the page names if possible (i.e. if you have a page named "What We Can do For You" this may be able to be renamed "Services" - or "Contact Chilli Websites" can be renamed "Contact Us"). If renaming pages won't work then we can setup drop down menus - there is currently a setup cost of $49.50 for this. You would need to determine how you want to organise your pages into drop menus and then we'll be able to set this up for you. Alternatively you may choose not to convert to responsive design yet - we are working on a design with a vertical menu which will better accommodate sites with larger numbers of pages and expect to have this available in the next month or two. Hopefully your website is now looking good - please go back to step 4 to finish your conversion!